Ever consider having having a mini-split system installed? A mini-split system might be the answer to your heating and cooling problem. These units have a split design without the elaborate duct work. Mini-split systems have at least one unit inside the home and one unit outdoors. Here are a few advantages to having a mini-split system in your home or office. Mini-splits are small in size allowing you to heat or cool an individual room or zone. The mini-split system has a sleek design that mounts high on a wall to blend in with your indoor decor. No more clunky window units blocking your natural daylight. No more worrying about installing, removing, or storing window units. No more worrying about electric space heaters and their safety concerns. Mini-splits are your answer to heating and cooling your space without spending a fortune running duct work. 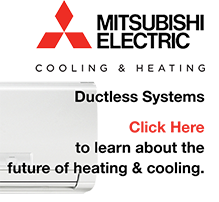 This heating and cooling option is perfect for home additions, office spaces, new construction, condominiums, apartments, townhouses, or to simply improve temperature control in specific rooms. The biggest waste of money is heating or cooling an entire house when you spend most of your day in one or two rooms. With mini splits, each zone will have its own thermostat allowing you to condition the space that is being occupied. Since mini splits are smaller than traditional forced-air systems, and because the temperature-controlled air is delivered directly into a room, there is no loss in efficiency caused by ductwork. The US government mandates that all new air conditioning equipment be rated at least SEER 13. Some new mini split units will score from 16 to 21 SEER. These higher scores mean more money savings for you. Since there is no ductwork to install, the units are easy to set up. The indoor unit can be up to 100 feet away from the outdoor condenser. With mini splits, the only construction required is a small hole in a wall for the copper tubing and control wiring. Depending upon the number of indoor and outdoor units required, your system can be up and running in as little as one day. You won’t have to worry about rebuilding walls or ceilings around ductwork. There is no loss of precious square footage. You could be up and running in no time with a mini split system. With traditional HVAC systems, air ducts must be professionally cleaned on a regular basis. Even after cleaning, dust and allergens are left behind. Since a multi split system is ductless, they offer multi-stage filtration that will not leave dust. This filtration will also reduces the bacteria, pollen, allergens and other particulates in the air. Anyone with pets or allergies knows the struggle of keeping their duct system clean. Eliminate the problem by eliminating the ductwork. 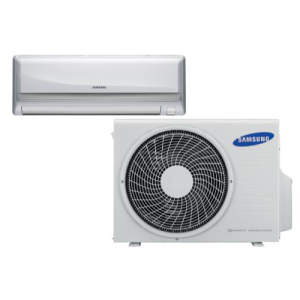 Mini-splits are a ductless cooling and heating system that follow ENERGY STAR guidelines. Ductless cooling and heating systems are far more energy efficient than the minimum standards set forth by the U.S. federal government. Duct losses can account for more than 30% of energy consumption, especially if the ducts are in an unconditioned spaces such as an attics, basements, or crawl spaces. Older properties usually suffer from energy loss due to poorly installed ducts and lack of regulations. When compared to our traditional heating and cooling options, mini-split units are more energy efficient and will reduce your carbon output.